This summer, we’d like to return and talk about some of our most useful, engaging, or popular posts. Today’s post, written by Jackie in 2014, reminds us that many of our students can easily come to love reading. It’s up to us to help reshape their reading identities. And, we offer a special congratulations to Jackie and Eric–whose wedding is tomorrow! Please return to this topic and talk with us in the comments–how do you help kids identify as readers? These words slipped off the tongue of my date as he sat across from me digging into a burger. I could’ve excused myself to the bathroom then slipped out the restaurant’s back door. Instead, I sat, paralyzed by his open admission. Does he not realize I teach English? My quaint dreams of cozy dates at used book shops and Sunday mornings curled around novels dissipated. I couldn’t possibly share my life with a non-reader. I spent months fostering a love for literature in my students. I handpicked books for my teens, stocked my shelves with the latest releases, and inhaled literature in my free time. Dating a non-reader was like sleeping with the enemy. Two years later, we are still together, and Eric has proven to be one of my most valuable assets in understanding self-identified non-readers. Just as I had pigeon-holed Eric into an archetype of resistant male readers, he had categorized me into the antiquated outline of his high school English teachers—the ones who made him hate reading in the first place. Eric’s teachers were staunch traditionalists. They assigned classics then tested, quizzed, and sucked any joy or personal exploration out of the books, leaving a pulpy mess of literary repulsion. Eric didn’t identify as a reader because his teachers had given him every reason to not identify as one: he struggled with literary analysis and didn’t enjoy fiction. Like many of my students, he skated through English relying on online cheat sheets to get around reading the required books. 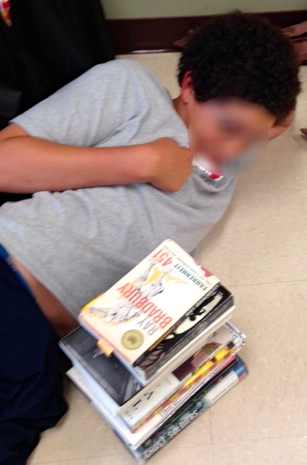 This same resistance to identify as a reader plagues many students who step into my classroom. They have fixed perceptions of what a reader is or should be— a person who reads fast, favors classics and fiction, and enjoys literary analysis. Self-identified non-readers see no room in reading for personal growth, gratification, interest, exploration, and pleasure. Ultimately, they see no room for who they are as a person when they recognize that the only celebrated books within English classrooms are those that fit a set standard of literary merit. Eric is drawn to informational books. Here are some of the books on his “to read” shelf. Eric was a self-identified non-reader simply because he did not favor traditional literary classics that his teachers drilled in high school. Yet when I first met him, he voraciously read online articles. Gradually he found his niche in books that dealt with scientific theories and particle physics. Recently, Eric completed The Quantum Story: A History in 40 Moments by Jim Baggott, a 410 page book, and he is halfway through A Short History of Nearly Everything by Bill Bryson, which is 478 pages. Furthermore, he listens to audiobooks on his commute to and from work and our bookshelves are packed with volumes on his to-read list, including On the Origin of Species by Charles Darwin and Discoveries and Opinions of Galileo. 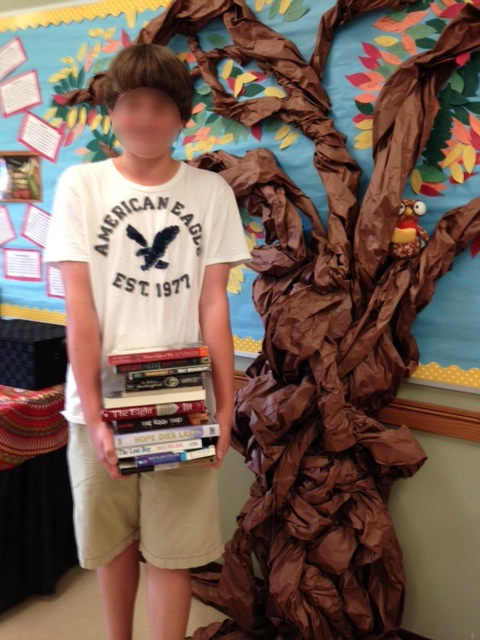 Trevor poses with his stack of books read throughout the year. have come to find Eric’s reading patterns in my own students. Trevor who hated reading found his niche amongst non-fiction books like Ghost Soldiers by Hampton Sides and Into the Wild by Jon Krakauer while Ben, who was rarely interested in whole class reads, challenged himself with diverse genres ranging from science (Stiff by Mary Roach and The Double Helix by James D. Watson) to historical fiction (The Book Thief by Markus Zusak). These students need the time and space to not only figure out how to define themselves as readers but to also establish a sustainable reading pattern. Ben with this stack of twelve books. This past weekend while winding the back roads of a coastal Maine town, Eric and I spotted a library book sale. I would usually be the one to erratically swerve to the side of the road and park on a sidewalk if it meant gathering additional books for my classroom library, but this time, it was Eric. As I sorted through the stacks of books, I looked up to find Eric with a stack equal to my own. This was exactly the type of person I could spend my life with. Great article. I think this is the most important statement: “These students need the time and space to not only figure out how to define themselves as readers but to also establish a sustainable reading pattern.” It implies respect for a reader’s interests, abilities and self-knowledge. Yes, we as teachers need to expose them to variety in order to extend their interests, but not impose the tedium of close reading which does little other than negate any reason which would encourage one to read.